There are times I sit down to enjoy a new baby food with my darling daughter, and we are confronted by a uniquely flavoursome punch to the palate, something we've never experienced before, but something we wouldn't mind much having to try again. And you know what? Because the world of baby purée is finite, we can try it again! But there's only so much deliciousness you can re -eat over and over again. So today it was on to new pastures, pastures containing carrots, red lentils, and cheddar. I very much had my suspicions that the lentils may turn out to be one of those foods added to the label to appeal to hipsters. Would I be proven correct? And would Emily make a face like this? 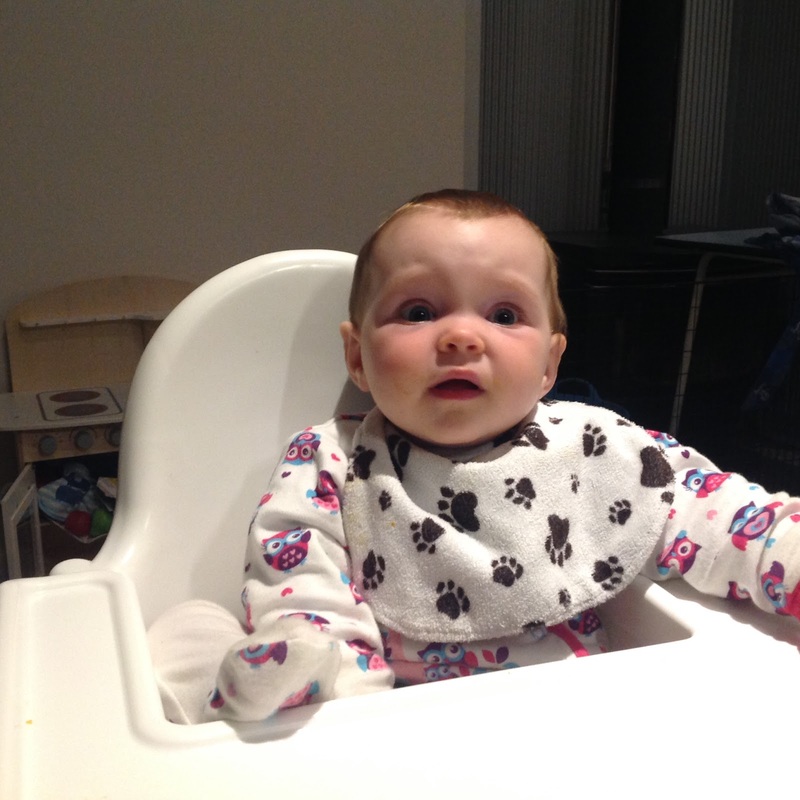 (Spoiler alert: yes, that's why I have a photo of her making a face like this). 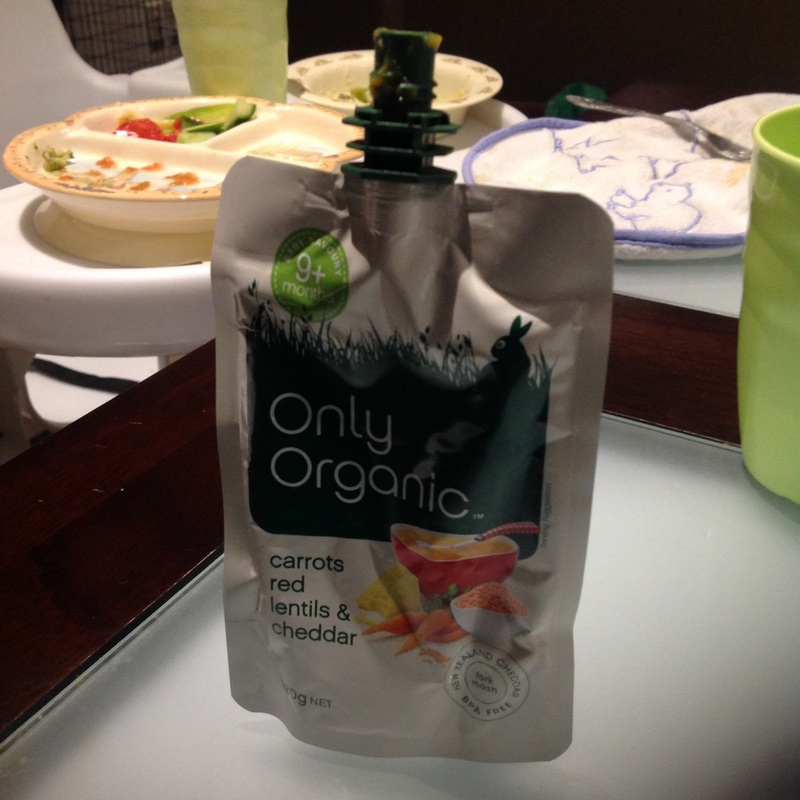 Ingredients: Vegetables (carrot (27%), pumpkin), Water, Apple, Cheese (milk) (5%), Lentil (4%), Ground rice. And, it's all starting to fall down already. There's already looking as though there's more of the ubiquitous fillers pumpkin and apple in this than anything else, with a good dollop of water to boot. It's a little bit of a shock there's no kumara. And what was that I said about lentils being a trendy trace ingredient? Emily's reaction: is pretty much summed up by the photo above. Mum had thought it a nice idea to try her on a piece of raw mushroom, a fungal delight her older brother inexplicably loves. Emily showed herself to be eminently more sensible, and had gagged and choked until the experiment was abandoned. 'Surely,' I thought, 'some pre-prepared packet food would go down a treat in this particular circumstance'. 'However,' I continued in internal monologue, 'past experience with cheese based foods would suggest the lentil and cheddar variety may not be the most welcome taste sensation.' Turns out the latter recollection was correct. First impressions: I'm pretty sure I've previously hypothesised that if you were to add pumpkin to a food, it's going to dominate the taste and texture. If I haven't, I'll hypothesise that now, albeit in retrospect. 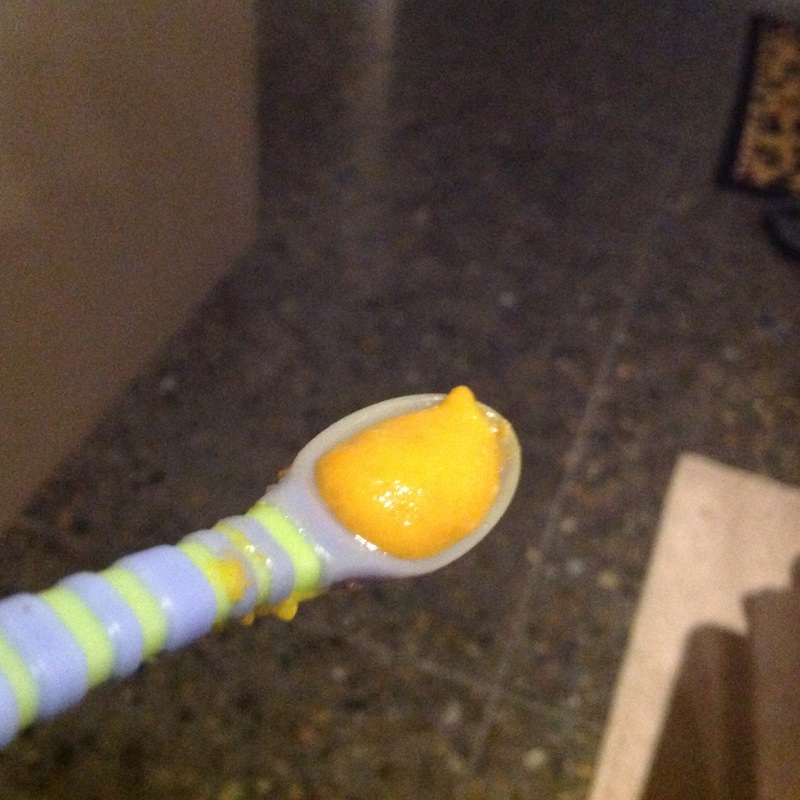 On the spoon, this was orange. Granted, that could have been the carrots, but the sinewy, granular texture was all too familiar from previous pumpkiney tastings. The smell was, similarly, all pumpkin. Not even a hint of apple to linger over the turbinates. Taste testing: I'm going to call it. What Only Organic have done here, is take Wattie's for Babies pumpkin and sweetcorn food, add some ground rice for texture, and put it in a packet suggesting far grander ingredients. I cannot taste cheddar. I cannot taste lentils. I will give benefit of the doubt, there may be some carrot included. But you are paying an extra seventy cents here for a bit of organic ground rice and a status symbol for a packet. Nothing more. Overall: 4/10. Not bad, but tastes nothing like what it says it is on the packet. Enjoy: trying to convince your friends at Thorndon Paleo Vegan Coffee Group and Crochet Club that your 9 month old is eating a pulse, when in fact they're actually eating a mass produced sludge aimed at a child half their age.